There's so much that could be said about Yuengling - the oldest brewery in the U.S. But, this feature is about one beer. Or, in this case, two. For the complete history, it's really best to visit the original brewery in person. It's such a fascinating tour, complete with a descent to the beer caves, which were walled off with brick by the federal government during Prohibition. For the beers, my original tastes of Yuengling brews count Lord Chesterfield, Black & Tan, and Porter amongst my favorites. Never took a strong liking to Lager, but over the years have found Bock and, now in 2018, the new Golden Pilsner to also be quite good. I would've chosen Porter here as my featured flagship, but it's not as widely available as the Black & Tan. And, by featuring Black & Tan, I'm indirectly featuring Porter, so there we go. They hit 190 years old this year and I'm sure we'll see them out 'n' about even more than usual. 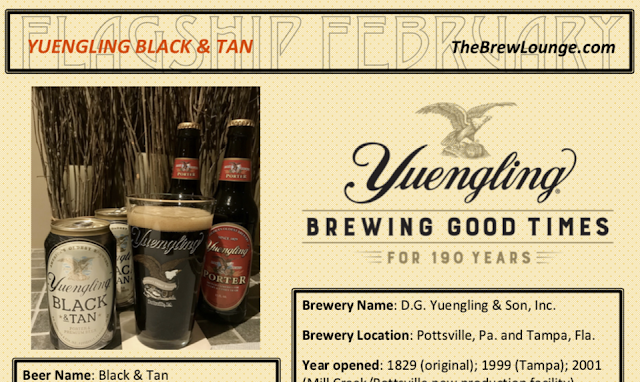 Now go click the picture below for a full feature on Yuengling's Black & Tan. If you're just jumping in during the middle of this and want to know what this is all about, link back here to see the Flagship February overview as well as an ongoing list of all beers I'm featuring during the month of February. Disclosure: For this project, I solely created the list of 28 beers featured here on The Brew Lounge. I was in contact with each brewery and neither required nor requested complimentary samples. I purchased today's Yuengling beer at retail.